I choose to read “Heart of Glass” by Marian Snowe because of it’s title. At first, I thought it might be a metaphor for transparent feelings of a woman deeply hurt by her first love. It is a good analysis, but it is not complete. 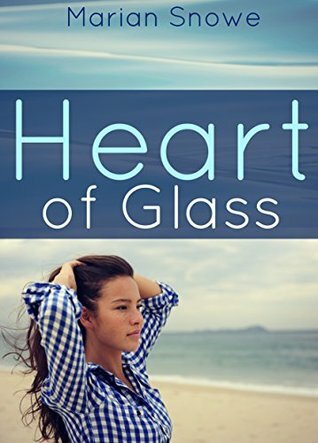 To my surprise, of course, it is more than that: “heart of glass” is indeed a heart of a woman with transparent feelings after a ruined relationship, who trusts to love again, but also a symbol for beach glass brought by the sea to the shore that can be seen along the beaches. Clara Duncan is the main character of this beautiful romance novel. She is torn to pieces after her breakup with her first love, Monica, was a woman totally her opposite: full of life, going to parades, parties and has lots of friends, while Clare was quiet, introspective and quite a loner. She and her first love used to work together at the same company and after it was found out they broke up, Clara felt somehow marginalized from the colleagues as they are closer to her former love and it wasn’t unexpected that at one point she was the one dismissed. At this point, Clara felt hopeless and without horizon, but thanks to her parents she found herself sent to New England into a coastal small town where her parents owned a vacation home. I loved the descriptive metaphors the author used to describe Wavestead, this small town by the sea, especially the sea and the skyline. Here, Clara enjoys the quietness of the home and the one of the sea and spends most of her time collecting sea glass. The sea glass has many shapes and colors, the rarest being green and purple, but one day Clara finds a broken urn that will change her life. In Wavestead, she meets two amazing women with whom she falls in love with. Of course, they have opposite characters and different goals in life. Ginny is the director of the Historical Society in Wavestead and surroundings , who will help Clara find the origins of the broken urn and Autumn, a local journalist that will do anything to seek and accomplish her revenge. Clara slowly falls for the beautiful red haired Ginny, a fountain of enthusiasm, a thirsty historian who will do anything to find the traces of the broken urn’s former owners. With Ginny Clara feels very much herself, but still the old fears conquer her feelings and darken her thoughts, as Ginny feels so much like Monica, an opposite Clara couldn’t and wouldn’t handle. She just wants to be herself without the fear she will be dragged in an over too social world, or being in love with a woman who will put her work above their love. Here is where the mysterious Autumn comes into Clara’s life. Autumn writes a small welcome article about Clara’s coming to town in the local newspaper. She wants to gain Clara’s attention and wants to make her feel important and also flirts with her. She won’t talk bad things about Ginny yet, she waits for the trouble to come itself into Ginny and Clara’s relationship and then misbehaves. Clara seems weak and childish to me, she trusts Autumn so much, but finds Ginny’s every flaw. She is easily convinced by Autumn that Ginny will always put her on the second place after her career, yet never tells Clara that she and Ginny were lovers before. Clara seems to give up on Ginny way to easily and believes Autumn’s every word without double checking, perhaps charmed by Autumn’s stunning looks : a beautiful brunette with stunning blue eyes. Also, Autumn sends Clara on a fake treasure hunt on a private propriety and Clara ends in jail. When Clara and Ginny meet again is now, when Ginny comes to Clara’s rescue and the truth about Autumn comes to light. Now, Clara and Ginny have no boundary left to disclose the broken urn’s story . It was the symbol of a long lost ago love between two high class women that lived here in the past century. They find the receiver of the urn and give it back to her, as a symbol of her love for the other woman. Two love stories entwined, one from our times and the other from a century ago. It is a beautiful ending for a beautiful romance.